Summon and Slay: Put a Blood Magic Spell into your hand. 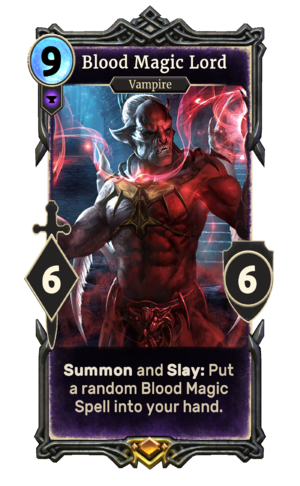 Blood Magic Lord is a legendary Endurance creature card. It is part of the Core Set. "Now you will see real power!" "Witness the power of undeath." "I will feast upon you!" "My bite will end your mortal life." "Your blood will feed my magic!" This card was previously part of the training mechanic where it could be upgraded from Volkihar Lord at level 50. A physical copy of this card was given out at the Legends booth at PAX East 2016. The physical copy is just a promotional item and doesn't provide access to the in-game card. Using the Blood Magic spells provided by this card contributes towards a title. This page was last modified on 15 February 2019, at 02:33.